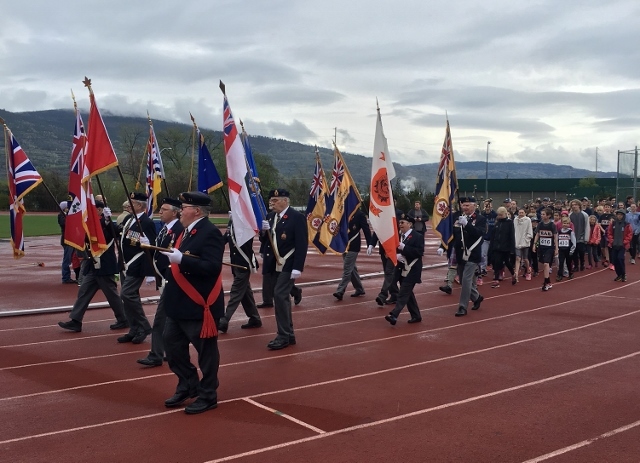 The meet is sponsored by the West Kootenay Zone of the Royal Canadian Legion as well as local Legion Branches 11 (Trail), 14 (Rossland), 170 (Castlegar) and 276 (Slocan Valley). The meet is sanctioned by BC Athletics and this is the 18th consecutive year we have hosted the event. Athletes aged 9 years and older (DOB 2010 and earlier) are eligible to compete. The meet is scheduled for Saturday, May 4, 2019 at Haley Park, in Trail. The events get under way at 10:00 am. This year there are a limited number of events for Master’s (35+ years) athletes (100-400 Metres, Discus and High Jump) for both men and women. Entry fee is $12.00 per athlete + $3.00 Day of Event Fee for non-BC Athletics members, which is payable during registration. Pre-registration is not required but would be appreciated. Sponsors of this event include: Gerick Cycle, The City of Trail, Ferraro Foods, Seven Summits Coffee, Pepsico, Pharmasave Trail and the Trail Times. The race is sanctioned by BC Athletics and is scheduled for Sunday, May 12, 2019 at Gyro Park, in Trail. The race starts at 9:00 am. We also travel to meets across BC, such as the Jack Brow Memorial Track Meet in Kelowna, the Junior Development Championships, and the Langley Pacific Invitational.